“Although the wind had abated somewhat from the weekend gales, there was still a healthy F5 SSW’erly blowing on Monday afternoon. Sensibly the Race Officers set a short inshore course three and a half times round with the start at Fitzwilliam, Under Tyne as the windward mark and an inflatable half way between Under Tyne and Tara as a wing mark for the four Redwings keen to race. Despite being the last to cross the start line, Olav Cole in Goose was soon out in front and despite best efforts by the other three boats, was never really under pressure. 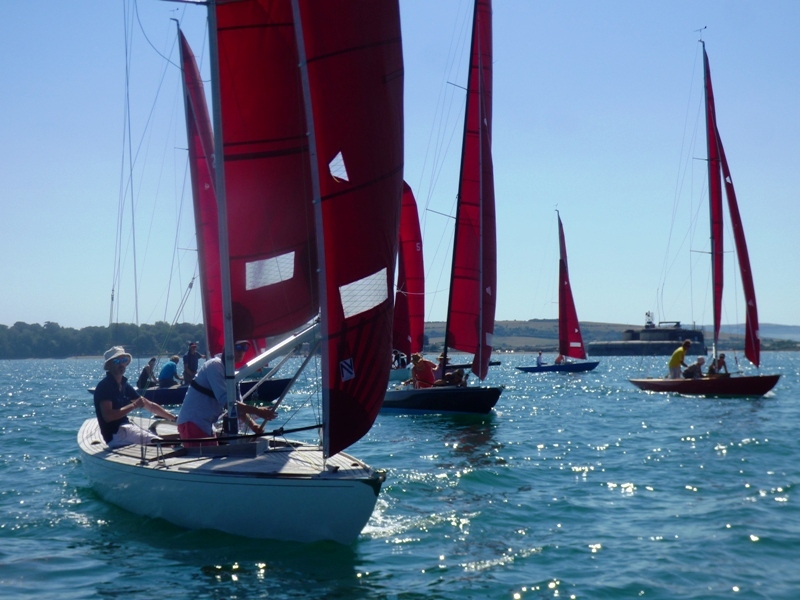 Andrew Eddy in Plover and Jonathan Nainby-Luxmoore in Snowgoose, both sailing only two up had some close racing for the first half of the race but Plover dropped back in the second half and only just managed to stay ahead of Peter Grimaldi in Redwing. There were no One-Designs. Tuesday saw eight Redwings and three One-Designs out enjoying the sparkling conditions. Initially a F3 to F4 SW’erly, the breeze backed half way through the first beat from Janson to Pepe which needed a course change at the leeward mark – Ruthven. After a clean start, most of the fleet tacked fairly quickly onto port and at one stage appeared to be making Pepe in one, however as they got closer, the ‘harbour entrance funnel’ kicked in and made it all a lot more challenging. Olav Cole in Goose and David McCue in Musicus lead the fleet to Ruthven and subsequently were never far apart on the beat to Tara, the run back to Ruthven and the finish at Under Tyne. Although not able to challenge the front two, the rest of the fleet had some close racing with a number of place changes on each leg. 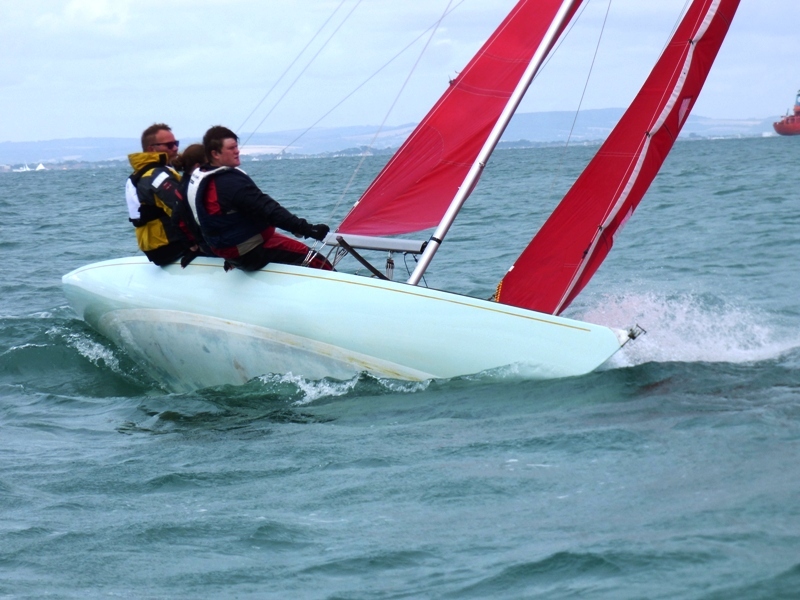 Having been mid-fleet for most of the race, Jonathan Nainby-Luxmoore in Snowgoose edged up into third place on the final beat. Meri Benham in Paroquet retired on the final run to Ruthven after her jib got tangled, and Richard Jessel in Blue Jay II caught Andrew Eddy in Plover port and starboard on the final few feet to the finish line. The three One-Designs had a similar course to the Redwings except that they went to Janson after Tara. The front two had a battle royal throughout their race; John Suffield in No 4 lead for most of it, but Anna Row in No 8 was never far away and after an hour and a quarter’s race finally made it into the lead on the final couple of tacks from Janson to the finish at Under Tyne and crossed the line just over a second ahead. Despite having the best start, D Orange in No 12 was unable to keep up with the others and finished a couple of minutes behind. 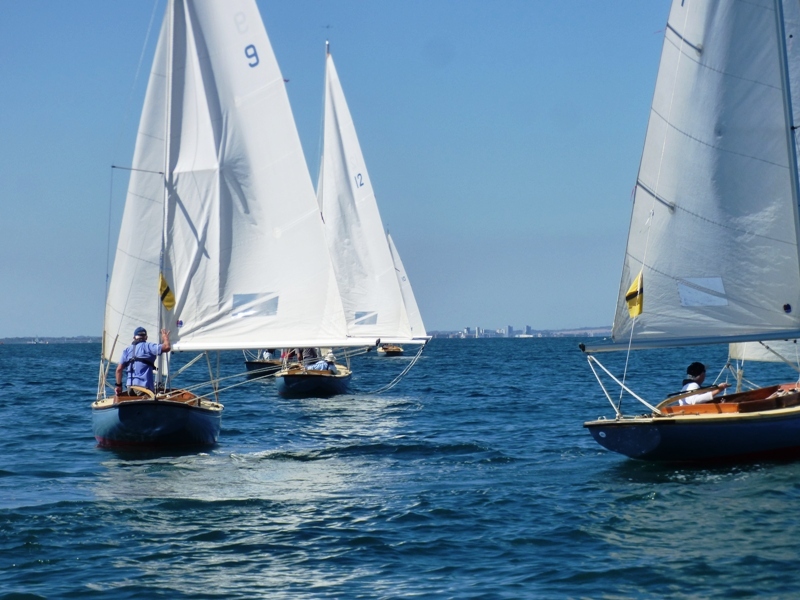 Wednesday provided another sparkling afternoon of racing. Although Redwing numbers were slightly down as a few owners were at Jill Attrills funeral, there were still enough for the RO team lead by the Commodore to set a challenging course from Janson to Tara and the out to St Helens Channel buoy twice with the finish at Under Tyne. 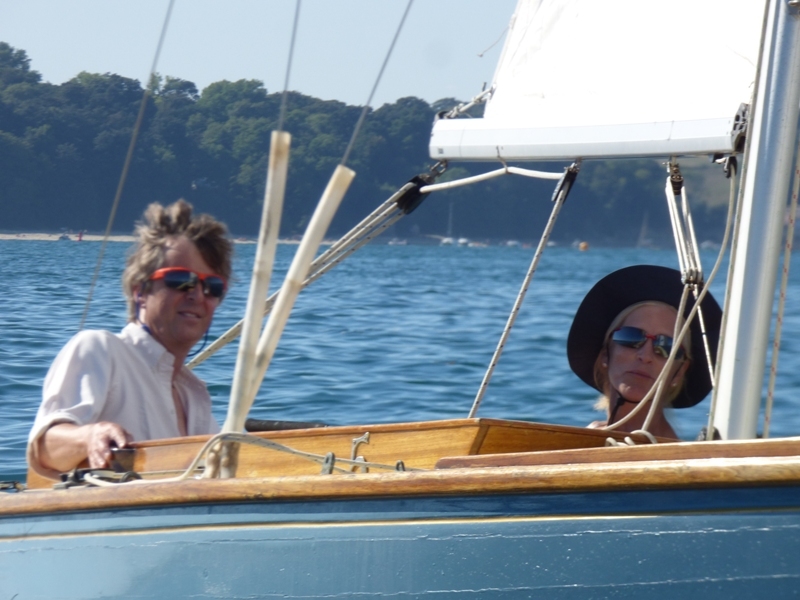 Olav Cole in Goose was first round the first mark and never relinquished his lead and finished a good two minutes ahead of Nick Wakefield in Bizarre, Meri Benham in Paroquet, David McCue in Musicus and Philip Bown in Redwing. The three One-Designs meanwhile were sent to E, followed by Ruthven, three times round. William Bland in No 12 got away from the others at the start where he remained throughout and was followed home by Sophie Ross and Penny Stanley. 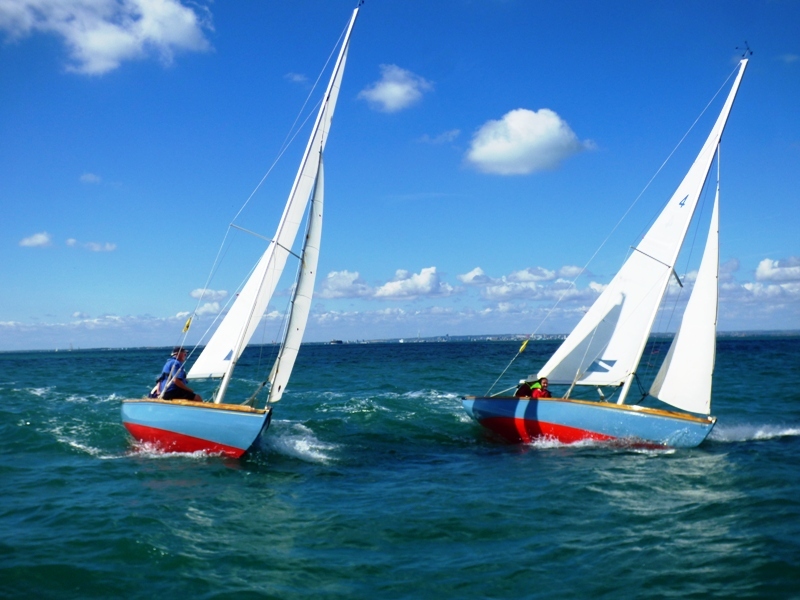 Despite their different courses both classes finished together in the perfect racing conditions. 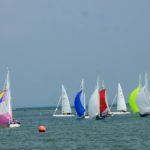 Thursday was programmed for two races for the Redwings with the second one being the Cadet race for the Norman Phillips Trophy. 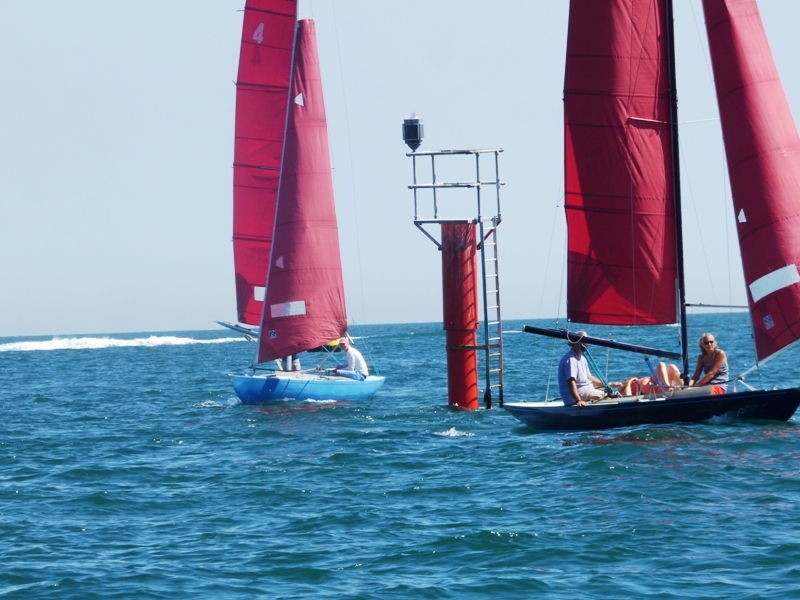 With a similar breeze to the previous day, the start line was set up was up close to Janson. The windward mark was Under Tyne and Derrick (via Janson) was the leeward one. Although the fleet of eleven boats split tacks soon after the good start, in the event there was little to advantage to be gained, Peter Grimaldi in Redwing was first round but was overtaken on the run to Janson and on to Derrick, by Goose, helmed by Olav Cole, and Avocet helmed by Barnaby Miller under the watchful eye of Rupert & Michael MacInness. On the beat back to the line against the tide, the breeze started to veer and drop which certainly proved challenging! After some close racing Avocet crossed the line seven seconds ahead of Goose; Jonathan Nainby-Luxmoore in Snowgoose was third & Redwing was fourth. With the six One-Designs becalmed on their way back from Derrick, the twelve cadet helms were set a windward-leeward course with Under Tyne as the windward mark & Janson as the leeward mark. Mind you with the light breeze going round in circles it was dubious whether it was going to be possible to even start, however with minutes to go it began to settle back to the SSE and meant that the beat to Under Tyne was pretty spot on. 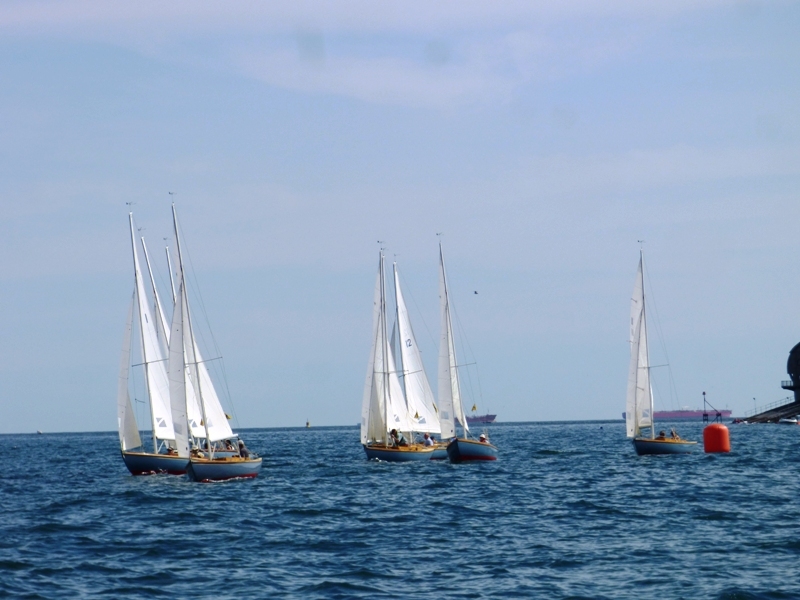 A number of boats tacked soon after the start and headed inshore to take advantage of the tide, however those who remained on starboard found themselves with powering along in the strengthening breeze. 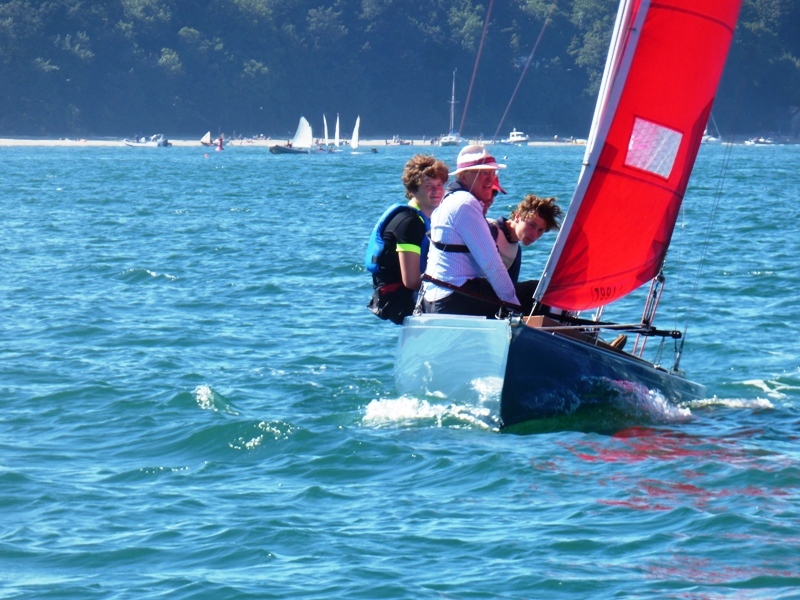 The front three boats, Thalia Chetwood in Goose, Barnaby Miller in Avocet and Jamie Winterbottom in Musicus were never far apart and showed considerable skill as they battled it out for the trophy. In the end however, it was Jamie in Musicus who crossed the line just over a minute ahead of Barnaby in Avocet with Thalia in Goose ten seconds later. Well done to not just the winners but to all the helms and crew for some excellent racing; indeed there were some very close finishes mid fleet. It was really good to see so many smiling faces. 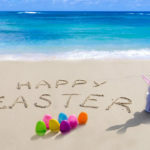 Despite the breeze to their south east, the One-Designs meanwhile were still stuck in the windless hole just north of the Fort so after an hour and a half, five out of the six boats decided to ask for a tow back to their moorings. The sixth, No 1 helmed by Helen Mathieson with Rob crewing doggedly kept going and eventually picked up the elusive breeze and finished in two hours and ten minutes. Certainly a lot longer that anyone had expected when they first set out! 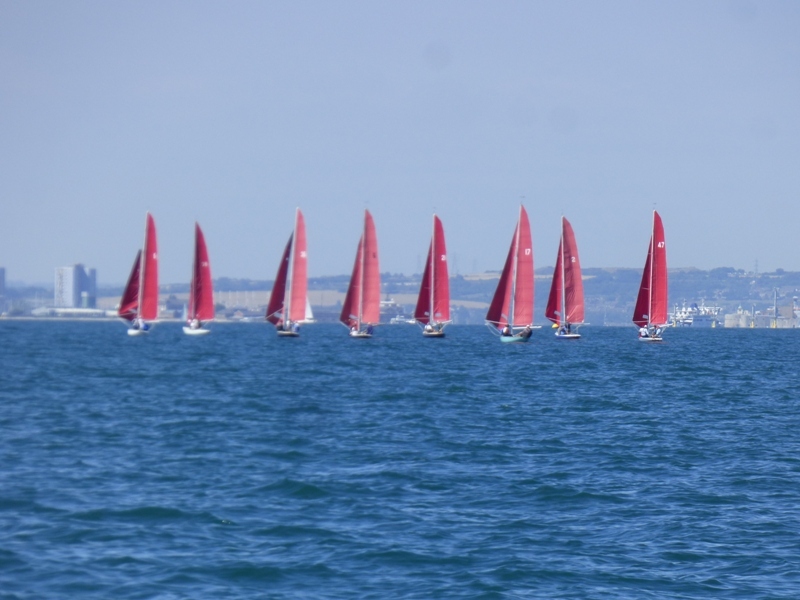 Friday afternoon saw eight Redwings head off to Cowes on their passage race in a F2/F3 SE breeze. 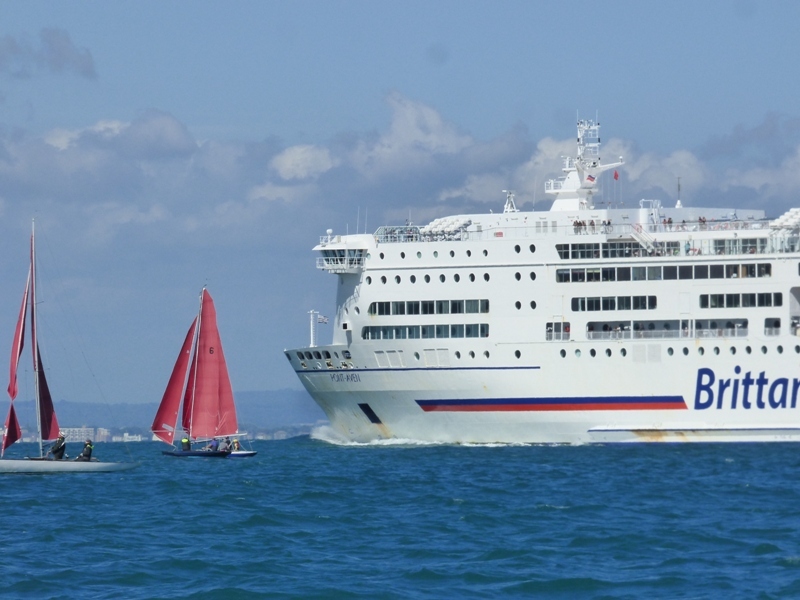 A few boats had set off earlier under tow and three others, also under tow set off later. It was a dead run to the Red Post off No Mans Land Fort and with the tide under them, it was all about trying to decide where the best breeze and strongest tide was. Hugo Cuddigan in Capella II took the eastern most track and rounded first with Joe Robertson in Red Gauntlet II not far behind having taken the middle route. Once past Ryde, those that went inshore struggled as the light SW’erly breeze started to take effect. 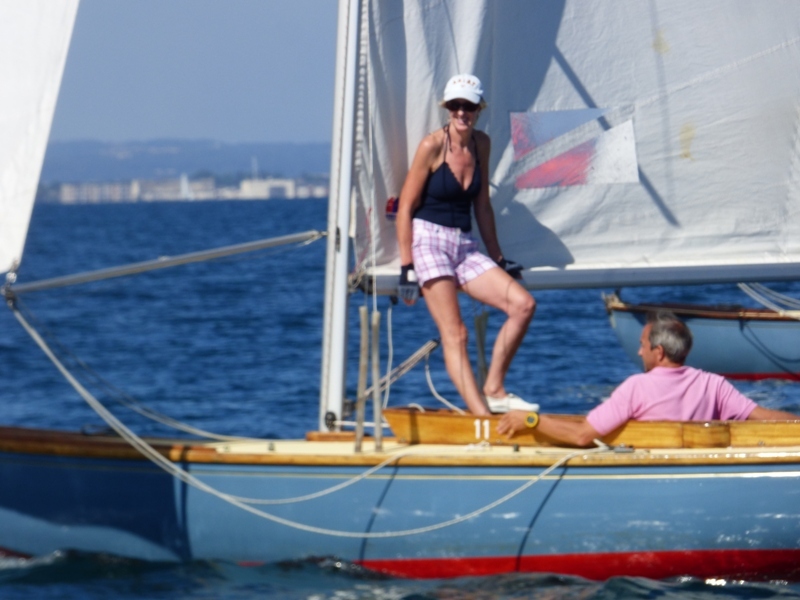 Jessica Speare-Cole in Avocet with Michael MacInnes offering sage advice took the middle route and crossed the RYS line some way ahead Red Gauntlet II with Richard Jessel in Blue Jay II was third. There were no One-Designs. 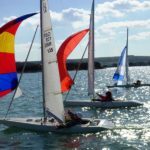 There was an excellent turn out on Saturday afternoon with ten One-Designs hoping that the light WNW’erly breeze would hold for long enough for two races. In the event it did and the fleet enjoyed some close racing in both of them. After a mixed start at Under Tyne, the fleet split as they headed off to Drum. Interestingly those that tacked early and went well offshore (in theory into more tide) appeared to come off best as there was slightly more breeze. First round was Susie & Syd Beart in No 5, followed closely by Jos Coad in No 8 and Mark Grzegorczyk in No 9. On the slow run to an inflatable leeward mark the fleet closed up but Susie held her nerve and finished just under a minute and a half ahead of Sarah Marshall in No 7, Jos in No 8 and Rob Mathieson in No 1. There were a number of very close finishes lower down the fleet. With the breeze threatening to drop off, it was decided that the second race would be twice round a short windward/leeward course. Most had good starts, although Sophie Ross in No 11 just over cooked it and then had difficulty extracting herself from the middle of the line to get back. Although not in fact OCS, Mark Grz in No 9 also came back but as he was at the pin end he was not disadvantaged too much. As in the previous race, the fleet split tacks on their way to Footprint. Hugh Doherty in No 10 was first round and never looked like being caught by the chasing fleet on the subsequent run back to Under Tyne and the second beat to Footprint where the race was shortened so that Sea Breeze could head off to set up for the EWCC Dinghy Regatta that BSC was responsible for running. Norman Marshall in No 7 was second and Mark in No 9 was third. Sunday afternoon was yet another glorious opportunity for nine One-Designs to enjoy two races. 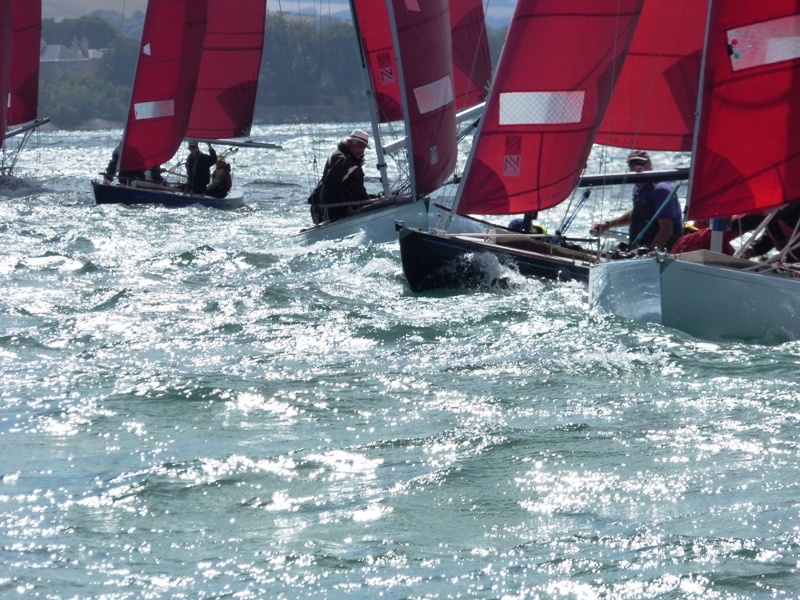 The SSE’erly F3 breeze held up well and although it was quite slow going on the run, there was certainly enough to keep the boats moving. The starting line for both races was about 200m from Britten with an inflatable as the pin. The first race got off to a clean start with most of the fleet well spread out along the line. Split tacks soon developed as helms tried to work out the best course to Tara. Ashleigh McLucas in No 6 and Alexander Ross in No 11 lead the way back to Britten with the rest of the fleet snapping at their heels. However Alexander worked his magic and crossed the line nearly three quarters of a minute ahead of Ashleigh, Hugh Doherty sailing single handed was third.